Remember that wonderful scene from “Out of Africa”? Actually there are several of them. The monkeys and Mozart. Mozart on the porch with Finch-Hadden, Mozart without Finch-Hadden…. all thanks to the Victrola. That’s our version, above, with Frank Sinatra’s “Night and Day” ready to be cued up. With all due respect to the people who revolutionized portable music with the Walkman and iPod, there is something about vinyl that gets under my skin. Maybe because I grew up with it. I do have an iPod and love to sound design my environment. See, that’s what it has become. I “sound design” rather than listen to music. And those earbuds… I don’t know… I can’t use them. 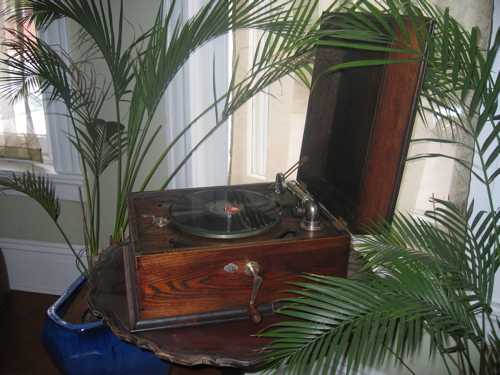 I pipe the playlists through a Tivoli Model One, or the stereo. Mrs. E. tells the story of visiting a boyfriend’s family at home. At cocktails, they would drag a record player out into the yard, sip gintonics and listen to Gershwin, or Porter. It may have been during those late afternoons that Mrs. E. began to develop her definition of the art of living well. It’s time to bring a little gentility back into your world. In honor of LucyInStLou’s post on the Murphy’s yesterday, why don’t you mix “the juice of a few flowers” (Gerald Murphy’s phrase), dust off the vinyl jazz records (the Murphys were huge fans of the genre and amassed one of the foremost collections of their time of early jazz) and retire to the veranda? Use your iPod if that’s your only option. But make sure to play American standards or a little jazz. And don’t forget to add a splash of grapefruit juice to the gintonics… it is a citrus that plays well against the lime. It is Friday, after all. This entry was posted in Entertaining and tagged Entertaining, Murphy's, music. Bookmark the permalink. Thanks so much for the link back! Your suggestion fits nicely with our plans tonight. We’re hosting some friends for Lillet with lime out on the deck. There is nary a record player in our home, but I will cue up the IPod with Gershwin. Summertime – one of my favorites and will be great to compile a cd to send to the wonderful concierge at the quaint hotel in Alsace. He was always playing great music and has a thing for American Jazz. Hi Jan, as well it should. As you know, but for the edification of the readers who are mew to the Murphy phenomenon, Phillip Barry, who wrote “the Philadelphia Story” for Ms. Hepburn, was a friend and guest of the Murphy’s… He wasn’t the first to use a bit of them in a published work. The phrase was Gerald’s. P.S., cheers, Jan! What a wonderful word picture you paint.